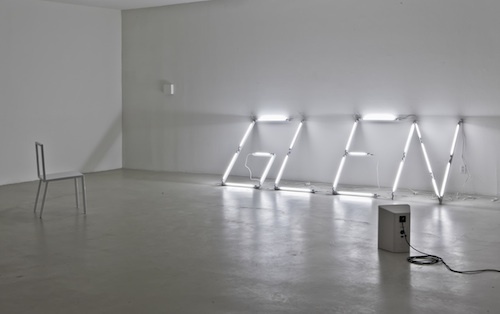 Glen Fogel, Glen from Colorado, 2009, fluorescent lights on powder-coated steel, MP3 player, motion detector, solid state relay, variac, amplifier, speaker, powder-coated steel chair, 100 x 48”. Spanning installation, drawing, photography, performance, and video, this ambitious exhibition brings together sixteen artists—almost all of whom were born after 1970—whose works reflect on the period of queer radicalism witnessed in North America from the 1980s through the ’90s. Meditating on themes of nostalgia, loss, and latency, the show consistently evokes a feeling of having arrived too late to directly participate in this traumatic but galvanizing political moment. Curator Jon Davies opens the show with a smartly selected group of video works that link past cultural icons with contemporary queer politics. Aleesa Cohene’s video installation Yes, Angel, 2011, presents a carefully constructed narrative of two intergenerational queer relationships using clips culled from melodramatic films of the 1980s; mobilizing metaphors of contagion that circulated during the AIDS crisis, the piece hints at ways in which complex emotional states are transferred from older queer generations to younger ones, suggesting that affects, like diseases, might be spread through contact transmission. Other works take a queer look at the art history canon; James Richards’s Untitled merchandise (lovers and dealers), 2007, for instance, is a collection of six knitted blankets that depict the names of Keith Haring’s lovers (in pink and blue) and art dealers (in red and yellow). See also Jonathan VanDyke’s performance Obstructed View, 2011, which makes the implicit homoeroticism of much AbEx painting into a blatantly sexual but surprisingly poetic encounter between two men on a locker room bench. Operating as a coda to these works, which explicitly reflect on the past, the second floor of the exhibition offers a more lyrical take on present queer relationships. Among them is Glen Fogel’s 2009 installation Glen from Colorado, which features a minimalist fluorescent light sculpture in the shape of the name “Glen” that pulses with light in time with the intonations of a robotic voice that dispassionately reads excerpts from letters the artist has received from friends and lovers, at times laudatory and at others, accusatory and cold.